Many people believe the American justice system is broken, especially after Justice Department investigations of police departments around the country found huge racial disparities. 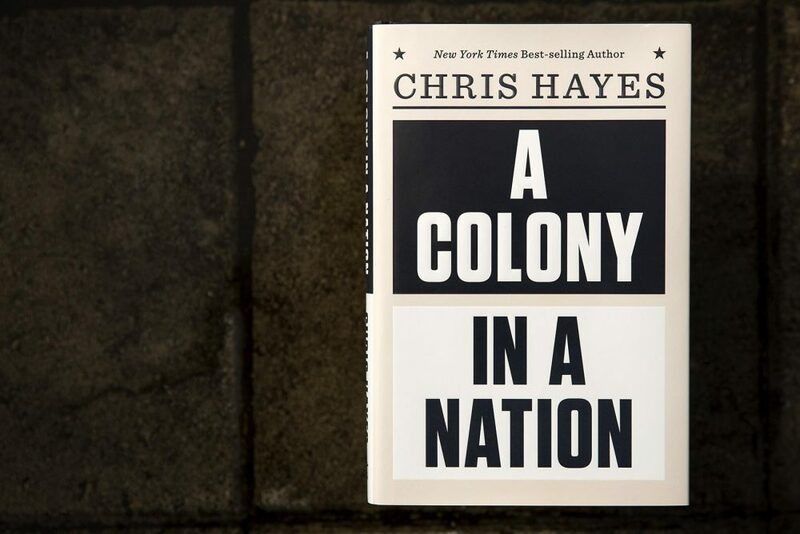 In a new book, MSNBC's Chris Hayes (@chrislhayes) traces the roots of the problem, and argues there are two separate Americas: the nation, and the colony. One is a place where Americans look to police to create order, the other a place where people feel more like they are in an occupied land. Here & Now's Robin Young speaks with Hayes, author of the new book "A Colony in a Nation." "We think about the American Revolution as fought over taxes, taxation without representation, but that's actually a bit misleading because at the time most of the taxes were collected as import tariffs, and they were collected and enforced through essentially policing actions. And what happens in the lead up to the Revolution is that the Crown decides they need more revenue and they start cracking down on smuggling. Smuggling is the lifeblood of the colonies at that point. And they inaugurate what I call in the book the 'first era of stop-and-frisk.' Ships pulled over with no notice, boarded, all sorts of merchants harassed and humiliated, and it is that experience of policing, I mean specifically policing, that is much of what raises the temperature of revolutionary fervor. You have mobs chasing customs officers down the street, tarring and feathering them. You even have, in the Declaration of Independence itself, Thomas Jefferson, in his bill of particulars, complaints against the Crown, says the following: 'He hath sent forth swarms of officers to harass our people and eat out our substance.' Now, think about that. That is the complaint that Eric Garner had, it's the complaint that so many people today have. "Obviously there's a big difference. Right, we have democratic representation, and I'm not saying that we are like the Crown. The point of the colony metaphor is to try to cultivate in readers the sense of the subjective experience of the power of the state feeling external, feeling unaccountable, feeling like an occupation. And so, the subjective experience of how a lot of people in this country experience policing is like that, even if the political structures are different in some important ways. You know, breaking the law or following the law is not the end of a conversation. It's the beginning of one. I say this all the time when I'm talking to people about immigration. They say they broke the law. And I say to them, 'Have you ever broken the law?' And the answer, if anyone's honest, always is yes." "I've not had very many brushes with the law, but I have had some — the campus cop at my college and then in the Republican Convention with Philly cops going through my bag as I went through a checkpoint and finding about $30 worth of weed in there. You know, in both cases, I think there's a judgment made, about whether to pursue the law or to let it go. And what I think is important to think about in this story isn't just the kind of double standard, isn't just the ways in which people from different backgrounds, demographically, racially, get treated differently by the system, but also the fact that it is the case that the frontline officer has a tremendous amount of both latitude and authority in enforcing the law. And in some ways it has to be that way. It is such a difficult job. It requires so many minute judgment calls. You wouldn't want to overly prescribe what they have to do in every situation because things are so kinetic and unpredictable. But at the same time, it is in that authority and latitude that so much of the kind of inequities of the system could come to rest. You see that when you're out reporting on this, and you see it when you experience it firsthand in the kind of benevolent versions that I did." "Breaking the law or following the law is not the end of a conversation. It's the beginning of one." On the rhetoric of "law and order"
"I think that one of the things that you see is that there is kind of a cloak of suspicion that attaches to blackness, and obviously that's not a new or novel observation. But it is very much bound up with a concept of order. You know, 'law and order' is this phrase, the two words sort of run together, you don't think of them as separate entities. Richard Nixon ran on law and order, our current president really hammered it home in his own convention speech, and what I think is so potent about the concept is it's much more, it turns out, about order than it is about law. What you end up [with] when you call for law and order is a system that seeks to preserve a certain kind of social order. And I think we saw that in the ways in which American society and politics responded to the great crime wave that happened roughly from the late-'60s to the early-'90s. We're seeing it now, in many ways, applied to immigration. People talk about immigrants breaking the law, but in a kind of deep, neurotic sense what's driving people is a sense of disorderliness, that the social order is coming unraveled and has to be preserved. "The language becomes more attenuated and more coded, and this word 'order' packs a very specific rhetorical punch because it speaks to, what to me is in some ways the dominant through line in American history, the most powerful emotional fuel of American politics, which is white fear. It's the fear of things coming unraveled at the hands of some other, that begins from the moment the very first ship to settle Jamestown lands on the banks of the shores, and the captain writes in his diary, 'We were attacked by the savages.' And it runs right through the crack years of New York City and right through today." On experiencing the "fear of the other"
"A big part of this book is, I am trying to figure out why did we build this? And by we I mean white people. By we I mean democratic citizens of the United States, it wasn't just white people. In fact, there is a bit in the book that uses some of the great work from [James Forman Jr.], who's got a book out about the kind of politics of crime in predominantly black and brown areas. But that said, yes, I felt it. I feel it, I feel the allure of order. I feel the sort of tingly sensation in the brain stem of the fear of the other. Those are things that we are given by our inheritance as citizens of this country, as white citizens of this country. The point isn't to feel guilty about it or to think that it's some monstrous entity. The question is how is that channeled and whether you recognize it for what it is. And part of the project of this book is to say to people, like, yeah, of course. Of course, there's the allure of that. Of course, there's some sense in which someone comes to us promising that if some set of people can be contained within the colony, if they can be controlled, then you can live free and flourish. That is a tempting bargain to be offered. It's not a ridiculous idea that there is a temptation there." This segment aired on March 21, 2017.